The RCW catalog describes RCW 81 as a medium bright 1x1 arcminute nebula. However, there is no apparent nebulosity at this location in this SuperCOSMOS image and according to SIMBAD, there are no references in the scientific literature to this object beyond RCW 81 itself. Avedisova, however, places RCW 81 in star formation region SFR 310.53+0.58 and notes that there is a molecular cloud in the same direction. A 2009 paper identifies two central ionising stars: [PZD2009] Star e3 (O6.5 V) and [PZD2009] Star e2 (O7.5 V). Star formation is taking place in the ring that forms the outer surface of this nebula. You can see the Spitzer infrared view here. Avedisova concludes that RCW 83 is ionised by the O7.5 V star HD 123590 and the B1 III giant HD 122669. The nebula can be seen as a bright rim at the edge of the dark cloud DCld 311.7-00.3. According to the Georgelins, RCW 83 and RCW 85 are the brightest parts of a diffuse region to the galactic east of the Cen OB1 association and that may be an extension of it. This tiny H II region is ionised by the B1.5 III giant LSS 3225 according to both Avedisova and the Georgelins. It does not appear to be visible, however, on either the DSS-2 or SuperCOSMOS plates. Avedisova lists two ionising stars: the O9.5 V HD 125206 and the B1.5 V CPD -60 5295. She places the nebula in star formation region SFR 313.41-0.35 along with the star cluster Loden 1256 and the dark globule FeSt 2-179. The infrared star group [DBS2003] 88 is embedded in RCW 85 according to Dutra and colleagues. This is the supernova remnant SNR 315.0-02.3. There does not seem to be any nebulosity at the RCW coordinates for this object, but there are some faint red filaments near by. This region is much more visible in X-rays as this Chandra report shows, and may have been created by a supernova observed by Chinese astronomers in the year 185. Curiously, SIMBAD has this "essential note" for RCW 86 : "Crescent-shaped HII region with a diameter about 3'. RCW 86 is frequently cross-identified with SNR G315.4-02.3 centered 40'NE; RCW 86 may be a part of the SNR or interacting with it. " However, there is no reference for this information and none of the recent sources I could find suggest that RCW 86 is anything more than a supernova remnant. There are wildly varying distance estimates for this nebula. According to a 1987 paper from the Georgelins, RCW 87, 88 and 89 are part of the same structure located at a distance of 3000-4000 pc, most likely closer to 3000 pc. RCW 87 and 88 are HII regions. According to a 2006 paper, RCW 87 may contain one of the most massive young star clusters (10300 solar masses) known in the Milky Way. [BDB2003] G320.15+00.79 is about 20-25 million years old, has a distance of 7600 parsecs, and its brightest members have evolved into red supergiants. According to one 2011 paper, RCW 87 is much closer at 1230 pc. A second 2011 paper gives a 2700 pc kinematic estimate. RCW 87 appears to be immersed in a larger diffuse nebula that includes IRAS 14597-5728, sometimes called the Black Widow nebula because of its appearance in infrared. However, Avedisova places IRAS 14597-5728 in a separate star formation region. You can see the full extent of RCW 87 in this Spitzer infrared image. Avedisova lists two ionising stars: [OM80] 19 and [OM80] 20 for this HII region, both with unknown spectral classes. She places RCW 88 in the star formation region SFR 320.24+0.42 along with the dark cloud DCld 320.2+00.4. SIMBAD lists the newly discovered infrared cluster [MCM2005b] 59 in the same direction. The Georgelins, on the other hand, conclude that RCW 87, 88 and 89 are part of the same structure located at a distance of 3000-4000 pc, most likely closer to 3000 pc. RCW 88 is located towards the edge of a much larger complex visible in infrared, as can be seen in this Spitzer space telescope image. The distance estimates given by Caswell and Haynes for the other objects in this complex imply that it may lie at a distance of less than 1000 parsecs, however, so RCW 88 may lie in the background. The ESO released a good visible light image of RCW 88 in 2012. There is significant uncertainty about what object this entry in the RCW catalog actually refers to. 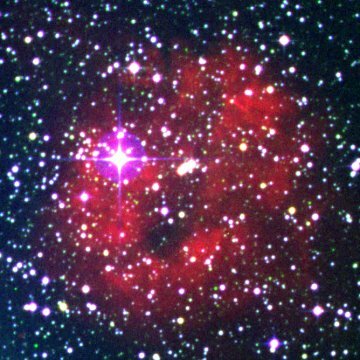 The RCW catalog describes this as a faint 4x4 arcminute nebula and the exact coordinates of the object appear to be the same as the radio HII region [KC97c] G320.4-01.1. More recent sensitive studies such as the SHASSA hydrogen-alpha survey show that this nebula is next to and possibly part of a far larger region of emission centred on the extended star cluster / OB association Pismis 20. SIMBAD identifies RCW 89 with the young supernova remnant SNR 320.4-01.0, and certainly emission from this supernova remnant dominates the nebula as the filaments in the image here show. A 2005 study gives a distance 5200 +/- 1400 parsecs and an age for the central pulsar of 1700 years. Humphreys gives a distance of 3980 parsecs for Pismis 20 and lists 6 ionising stars, including the O 9.5 I supergiant Pismis 20 #11. SIMBAD lists several other hot stars in the same direction, including the O 8.5 I supergiant Pismis 20 #2, the O9 III giant Pismis 20 #9 and the Wolf-Rayet star WR 67. A 1988 paper suggests that SNR 320.4-01.0 may be part of Pismis 20 and the currently available distance estimates seem to make this a possibility. Another possibility is that we are looking at two objects in this direction, with a large faint diffuse nebula surrounding Pismis 20 in the Centaurus arm and the brighter more distant SNR 320.4-01.0 located in the 3Kpc arm or perhaps the galactic bar region. The Georgelins conclude that RCW 87, 88 and 89 are part of the same structure located at a distance of 3000-4000 pc, most likely closer to 3000 pc. You can see a spectacular recent Chandra x-ray image of the pulsar wind nebula within the supernova remnant, often called the "Hand nebula", here. You can see the full extent of the nebula surrounding Pismis 20 in this false colour hydrogen-alpha image. This is the planetary nebula ESO 176-12, according to SIMBAD.